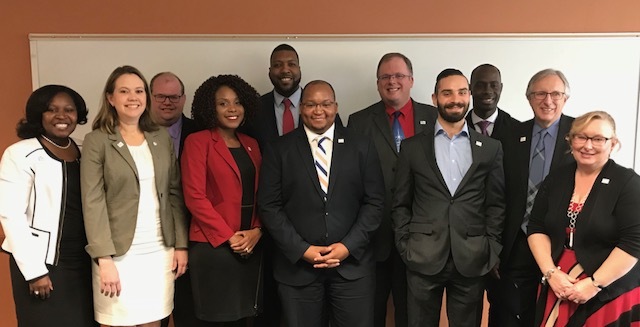 Greensboro, NC – The North Carolina Institute of Political Leadership graduated its 57th class of Fellows on Saturday, December 2, 2017, on the campus of the University of North Carolina at Greensboro. The Institute is a non-partisan, non-profit leadership organization founded in 1987 to improve the practice of democracy in North Carolina. Its mission is to educate future political and community leaders in modern campaign strategy, ethical decision making, and governance, such that its participants will have a sound grounding in ethical behavior, consensus building, and cooperative and collaborative leadership. No other program in North Carolina offers such a comprehensive curriculum in strategic non-partisan political leadership development. Fellow Asia Prince delivered the invocation, followed by Fellow Leonardo Williams who delivered remarks on behalf of the class. The Honorable Henry E. Frye, Former Chief Justice of the North Carolina Supreme Court, gave the commencement speech. NC IOPL offers two annual Fellows classes in spring and fall. Graduates of the fifty-seventh class will join an alumni network of more than 1,100 graduates of the NC IOPL Fellows Program, individuals who have served and continue to serve the citizens of North Carolina.